More and more, the supermarkets in the Lehigh Valley are resembling northern New Jersey's. While ShopRite tried and failed in the area a decade ago, Joseph Colalillo and his Supermarkets of Hunterdon County have returned, setting up shop in a new-build multi-use complex outside of Bethlehem. The beautiful new ShopRite of Bethlehem opened in 2015. We see Superfood Marketplace, an Elizabeth-based company, opening in a space formerly occupied by a long-time Lehigh Valley chain, Valley Farm Market. Juan Diaz owns two C-Towns in Allentown and Bethlehem, as well as an AIM (Association of Independent Merchants) market in Allentown. The Easton Food Market in Easton is part of the NYC-based Associated Group. And while it didn't last, there was an NSA Supermarket in Bethlehem as well. 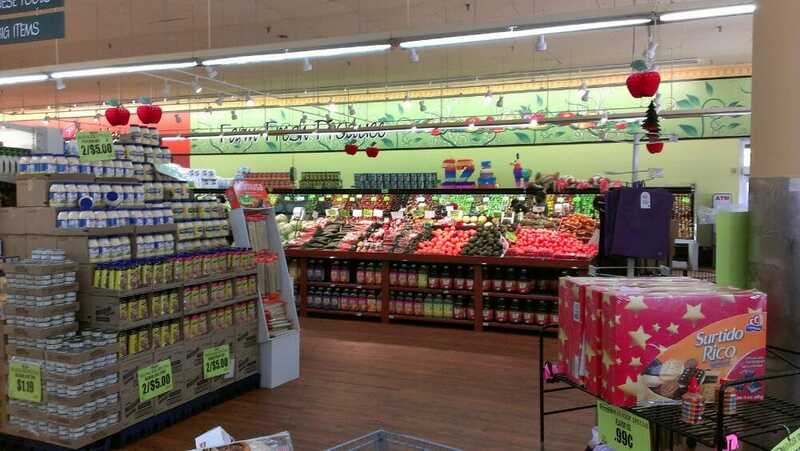 In October 2015, Plainfield, NJ-based Supremo Foodmarket opened in a former Sears department store in center-city Allentown. After extensive renovations, the store may as well be a new-build location, but the outside maintains the unmistakable, hulking architecture of early 1900s department stores. The supermarket, being in center-city Allentown, has a long and narrow parking lot which it shares with its next-door neighbor. No problem, right? Except . . . the next-door neighbor is a supermarket. Luckily, it's owned by a business partner of Eddie Trujillo's (the owner of Supremo), Juan Diaz (see above). So, the two stores complement each other, rather than compete with each other. Supremo, for instance, has seafood, but no hot food. Little Apple next door has no seafood but does have an eat-in hot food area. We'll take a look at Little Apple next. The entrance and exit to Supremo face the parking lot rather than the street. 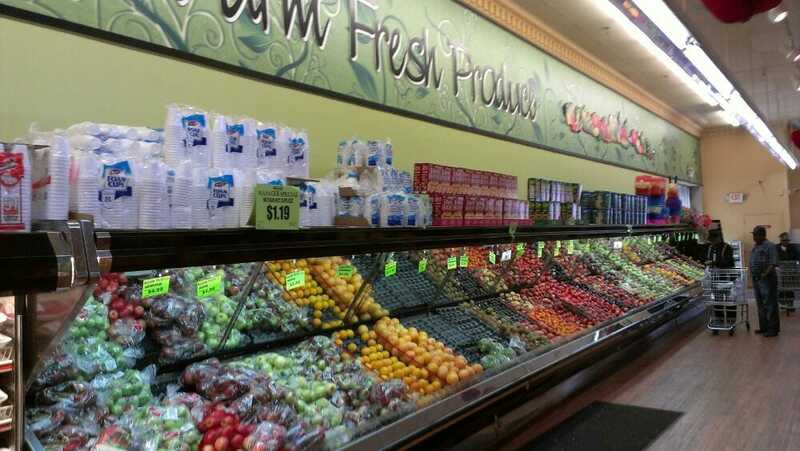 Upon entering, you turn left past the security counter and enter the produce department. The deli is in the corner we see in the photo above. Dairy lines the back wall, and meat and seafood are on the opposite end of the store. The entrance is behind me to my left, and the security desk is directly behind me. The deli is in the front corner, with the "Wall of Values" continuing along the wall to the right. The parking lot and produce department are behind me here. Here we are looking along the back wall from the Wall of Values towards meat and seafood. The freezer aisle is the second-to-last aisle, with meat being the last. Looking along the back of the store towards meat. The freezer aisle is directly to my right here. 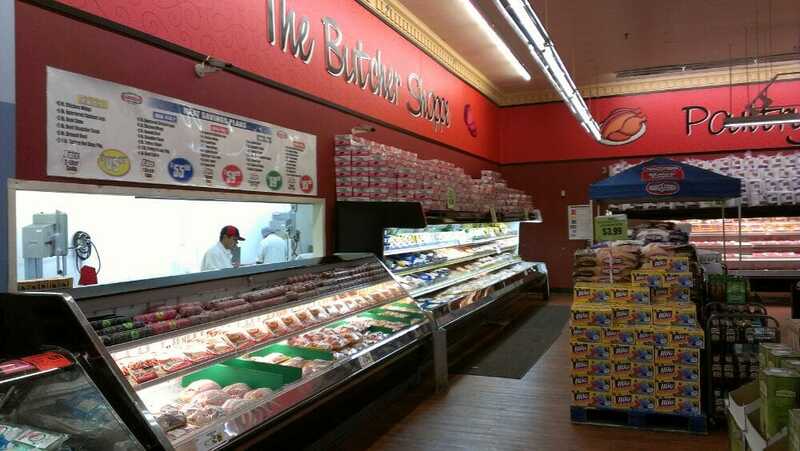 The back half of the wall is packaged meat, with meat and seafood service counters on the front half. Despite the fact that the "seafood" sign is on the front wall of the store, the counter is actually next to the "Butcher Shoppe" area. Customer Service is next along the front wall of the store, where all the HABA items are. 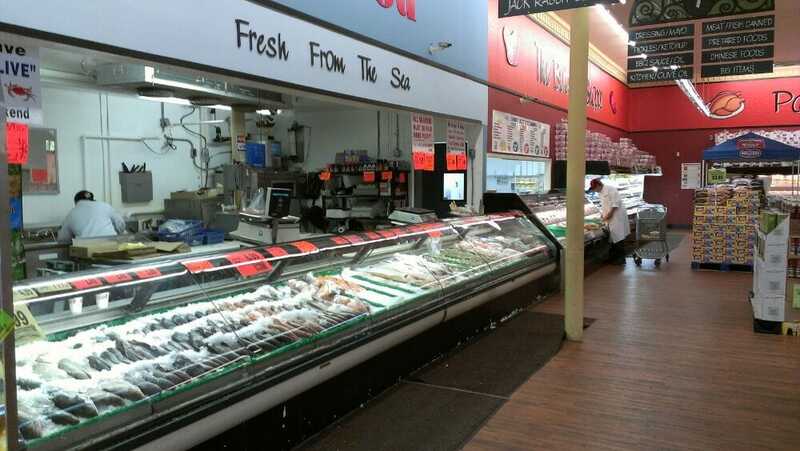 Here we're looking from the meat/seafood side back towards the deli/produce side, with checkouts to my left. Now, the Irvington location is a perfectly nice store. It's certainly much nicer than the average low-end inner-city supermarket that one might expect in an area like Irvington. The flooring, decor, and shelving have all been updated recently. But there certainly is no comparison between it and the Allentown store. Stay tuned for a tour of Little Apple on Tuesday!